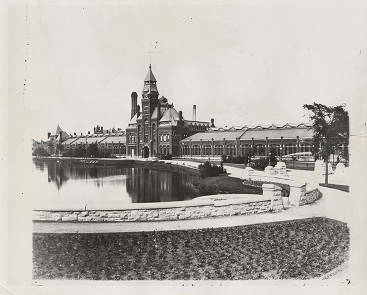 Copy of a photograph showing the original 1881 Pullman Clocktower/Administration Building with north and south wings and Lake Vista om front. Description Copy of a photograph showing the original 1881 Pullman Clocktower/Administration Building with north and south wings and Lake Vista om front. Creator Newspaper Division, Field Enterprises, Inc.